Between 8 and 15 species (botanists can't seem to agree) of American pitcher plants can be found from Texas wetlands and the swamps of Florida to the marshes of southern Canada. Most species, though, have very small ranges, because they grow only in permanently moist areas like swamps, lake edges, riverbanks, bogs, fens, marshes, and springs. Color, nectar, and a delicious scent lure insects into this plant's pitfall trap. Drunk on the plant's intoxicating nectar, an insect slides down into the slippery tube. Downward-pointing hairs within the pitcher ensure that it can't crawl out. At the bottom of the pitcher, a pool of digestive acids and enzymes slowly dissolve the insect's body. 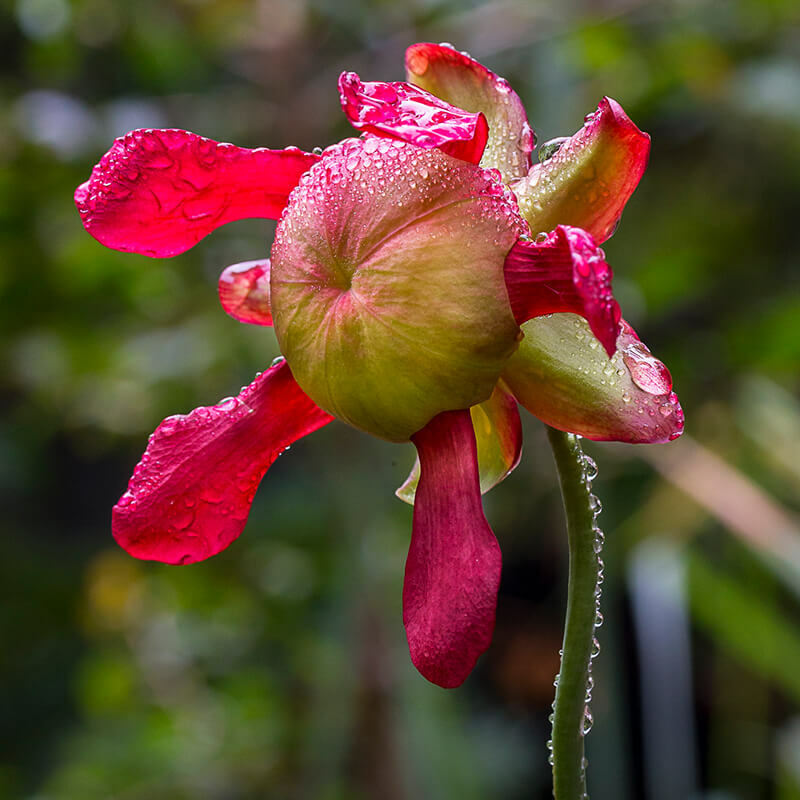 The pitcher plant absorbs precious nutrients—nitrates and phosphates—from its prey, which can be ants, flies, wasps, bees, beetles, slugs, and snails. It looks like a flower, and (to an insect) it smells like a flower—but it's a trick! This plant's "pitchers" are actually specialized leaves that grow in a funnel shape. The lip of the pitcher releases secretions that attract its tiny prey. A "hood" extends over the top of the pitcher and prevents rainwater from filling it up and diluting the lethal brew inside. Pitcher plants are herbaceous perennials; they blossom in spring, then wither and go dormant in winter. They grow in clumps and can spread to several feet in diameter. Depending on species, pitchers can be 6 inches to more than 36 inches tall. 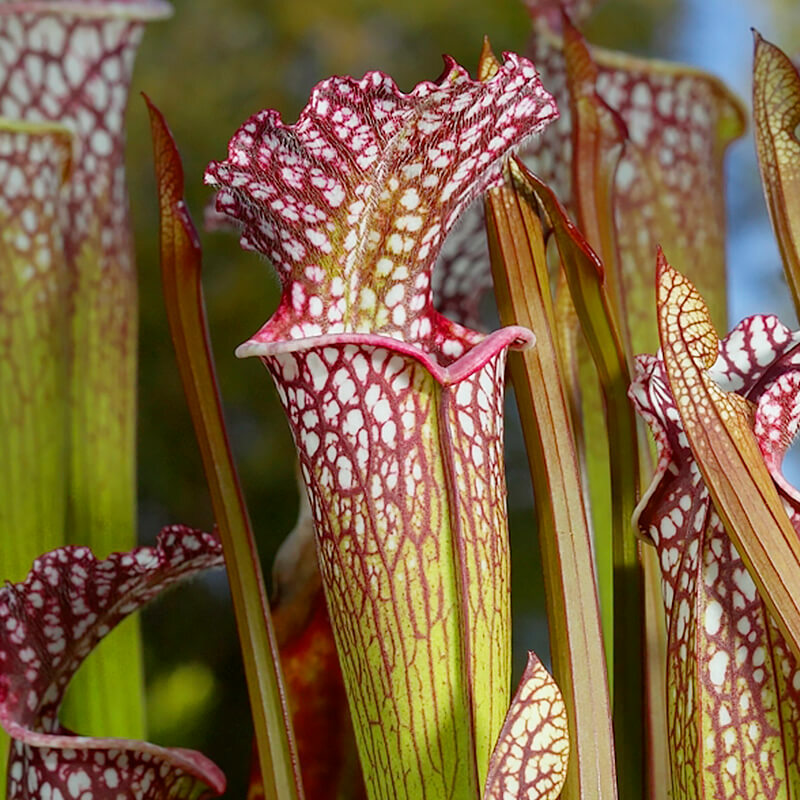 Interested in growing your own carnivorous plant garden? You might want to start with an American pitcher plant. Experts say that they are among the easiest carnivorous plants to grow, but do your homework to see which nursery-propagated cultivars grow best in your area. American pitcher plants, shipped to England, were popular in British gardens in the 19th century. This plant's wetland habitat is shrinking quickly, and for a variety of reasons. Invasive species such as kudzu vine have changed many wetland habitats, and herbicides kill wetland plants. In some places, recreation areas, housing, and agriculture have replaced wetlands. One species and two subspecies of American pitcher plants are on the US Endangered Species List, and at least one other species that has been assessed is vulnerable. In spite of federal—and in many cases, state—protection, illegal plant collectors sometimes still take plants and seeds from the wild. Responsible gardeners can purchase nursery-propagated pitcher plants, which are grown from cultivated stock. Be sure to question your nursery about the origin of a pitcher plant before you buy it. Naturalists originally supposed that the plant's hollow pitcher was nothing more than a hiding place for the insects they saw there. In 1815, a botanist observed more carefully and noted that the insects attracted by the plant's nectar died inside. 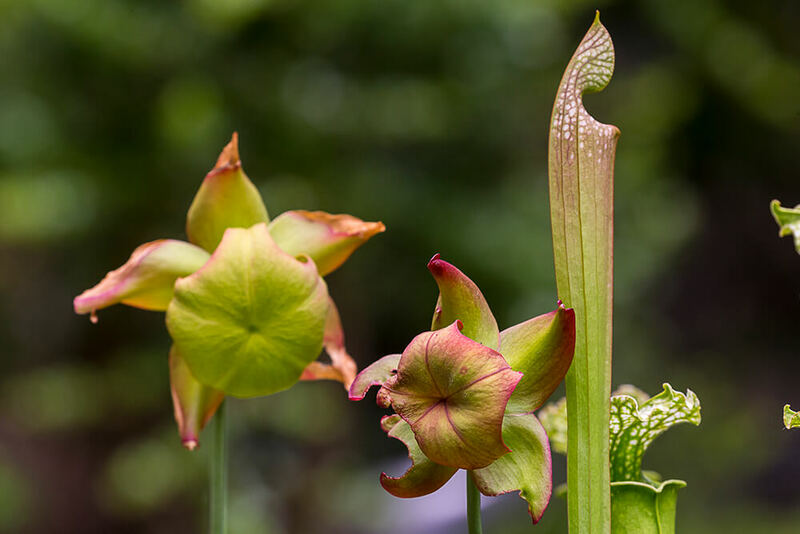 The genus name Sarracenia is in honor of Dr. Michel Sarrazin, a French surgeon and naturalist who immigrated to "New France" in North America in the 17th century. He sent specimens of many native plants, including pitcher plants, to be studied by the Academy of Sciences in France. Flowers blossom in early spring—on long stems, to avoid trapping potential pollinators. Seed pods turn brown and split in the fall, scattering seeds.